Join The HD Adventuring Club! It's been a long time in the works, but finally our camper trailer to tiny house conversion is nearing completion. Below we detail what we did to the place, and how it turned out. First, take a look at how the trailer looked before. It was the classic wood veneer cabinetry and ugly wallpaper. It was livable for a weekend, and thankfully all of the appliances were in good shape. But we wanted more. We started out doing a couple small projects, and kept realizing new potential for this little place and ended up nearly redoing it all. Be sure to let us know what you think in the comments, and follow us on Instagram! 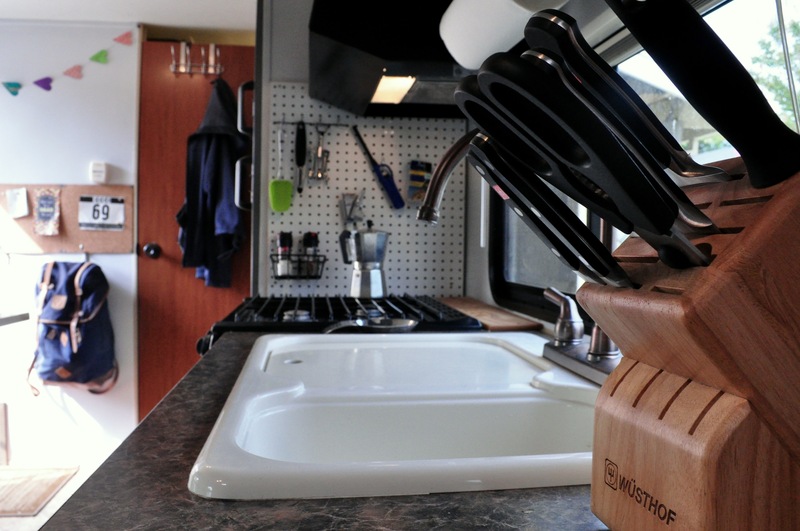 Most of our kitchen items are on display, but we like the look! 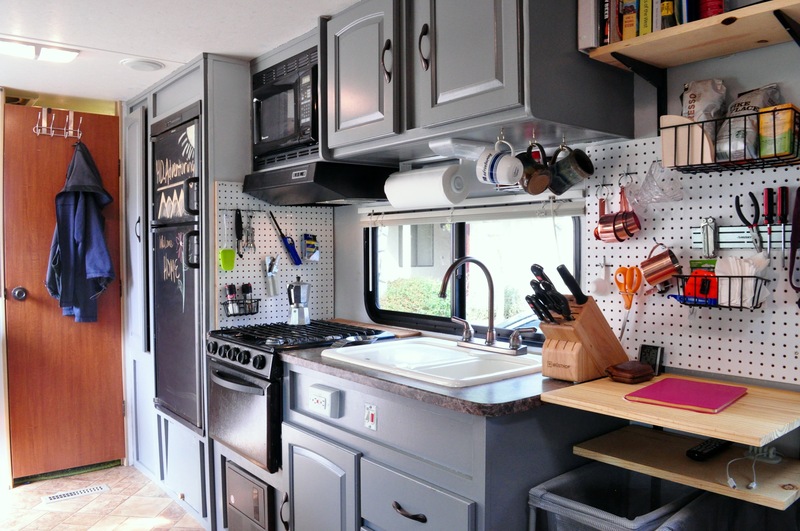 One of our favorite features: Pegboard to hang all of our kitchen accessories. We rarely watch TV, but it does display our photos nicely! Our bench, which has ample storage underneath, and folds out to be a bed. Click Here to read about how we made the cushions! The desk. Small but functional. Enough room to do work, but not enough to permit clutter. We custom built the end of bed storage. Pine boards pull out, with lots of space underneath. In the middle of the storage area, we have an outlet that also has USB ports. Got to keep our batteries charged! We hope you like it! Share us with your friends, subscribe to our blog to see where our new tiny trailer home takes us, or follow us on Instagram @HD.adventuring. Read more about our story here. Inspiring!!! Great job Heather, seems like you have inherited your dads gift for creating something awesome out of nothing much and your moms keen eye for quality, simple, gorgeous taste! i like what i saw do you have a bathroom toilet, shower sink? Really well done (does it have a toilet?). Thanks for all the love! Yes, It does have a bathroom, but we didn’t photograph it because we didn’t touch it. (yet) We may redo it at some point, and will document it here! We actually just bought a Ford F-150 to pull it, and will be moving into it this Saturday. We will update this blog with more details on our new location, and how the move goes! The beauty of using a travel trailer as the base, is that it is designed to be pulled, and is very lightweight for the square footage. Stay tuned! 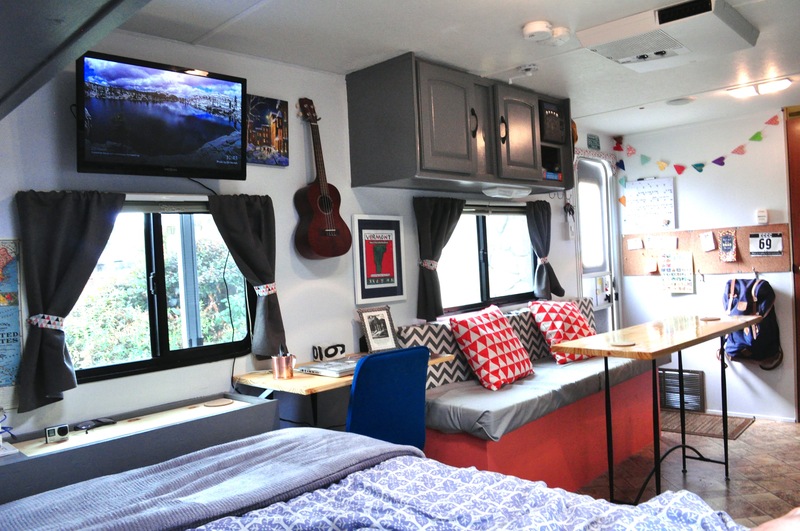 I have been following tinyhousetalk.com for years now and this is the 1st rv to tiny house conversion that I love!! You guys did an Awesome job!! Did you insulate any extra? Thanks so much! That really means a lot! We didn’t insulate any extra, as when we did all the work we were sweating through a HOT California summer. Now that it has cooled off a bit, we have mixed thoughts on our decision. We are never cold, but if we could go back we probably would have added some extra insulation in a few key areas. The coldest seeming spots are actually the windows and doors, so we are researching ways to insulate those. AMAZING!!! My partner and I just bought a Happier Camper, and are headed out to do the West Coast this summer (from Texas). 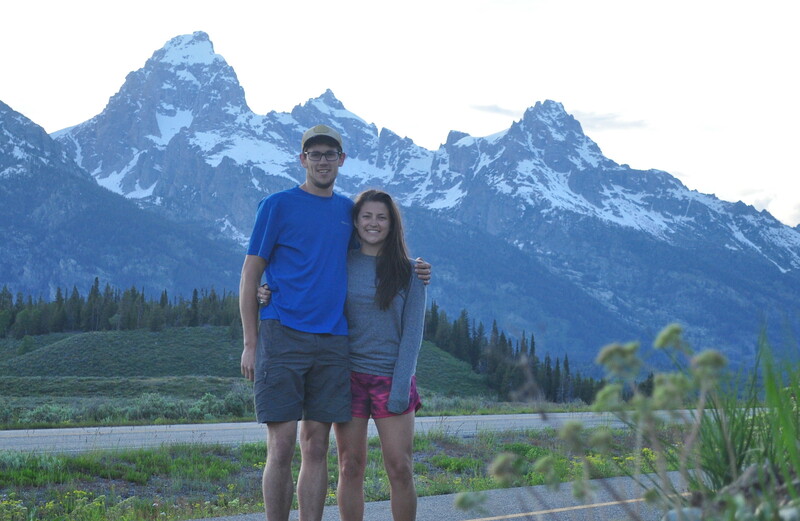 But we looked for over 2 years for the right “travel home.” We have looked at everything from a class a, b and c rv’s to travel trailers of all sizes and even considered converting a van for a while. We are totally newbies, so decided not to rennovate one. 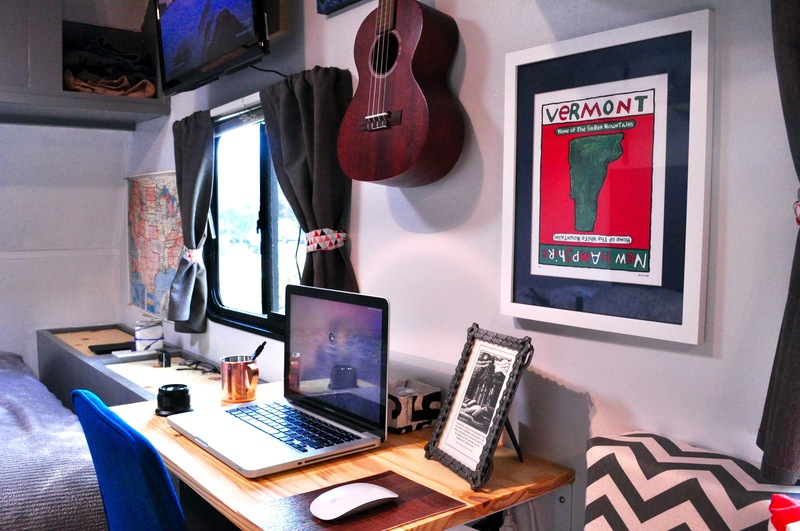 But I LOVE LOVE LOVE what y’all did with this travel trailer. I have dreams of buying and restoring trailers (but at this moment have zero experience with anything handy). 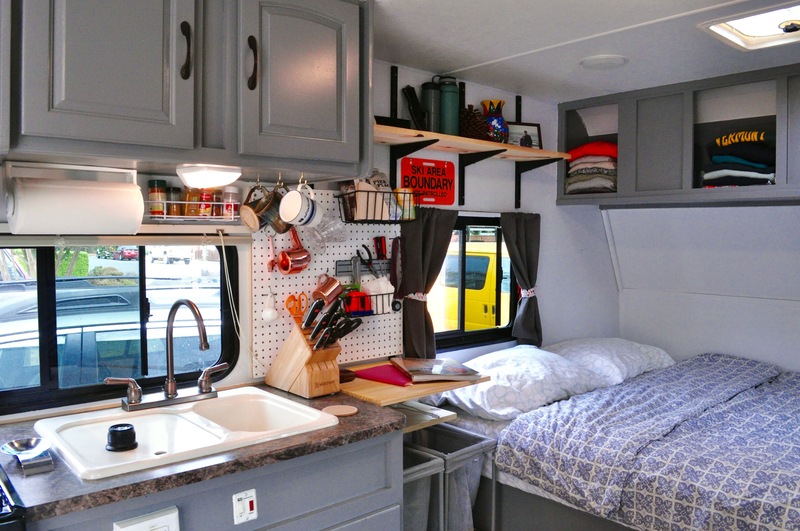 Anyway, I’m super excited to have found your website and just wanted to zip y’all a note to say how cool your trailer looks (saw it in the Tiny House newsletter). Ahhh we’ve seen the Happier Camper, they look great! Your trip sounds amazing! I strongly suggest hitting Big Sur. If your looking for a place to park the camper, try Nacimiento Ferguson Road. Best sunset in the world! We were newbies to the whole scene as well, and struggled choosing how much work we wanted to do. It was a challenge to figure everything out, but was extremely rewarding. We’re already looking for another trailer to work on! Would like to see an update. Also, how DO you store your dining table? You never mentioned that. An update is in the works! We actually ended up ripping out half the bench, and installing a longer desk. 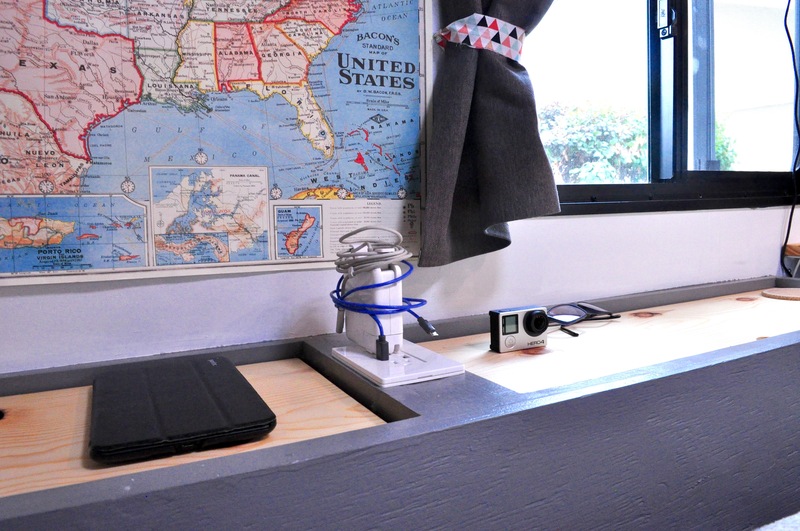 The desk also works as a kitchen table, and makes the whole place a heck of a lot more open. Would love to see photos of the new longer desk! We are Dana and Heather. Adventure seekers, dreamers, tiny house dwellers. We hope that by sharing our stories, we will inspire you to get outside, explore your world, and simplify your life. Join the club to receive updates, Inspiration, and be the first to know about our adventures!